I listened to the scanner all night last night as reports were flowing in from around Cullman County. I was relaying these reports to ABC 33/40. 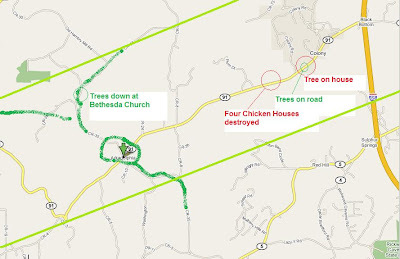 The greatest amount of damage was along Highway 91, especially around Arkadelphia. (00:58:53) iembot: HUN continues Tornado Warning for Cullman [AL] till 1:15 AM CDT ...AT 1251 AM CDT...WEATHER SERVICE DOPPLER RADAR CONTINUED TO INDICATE A SEVERE THUNDERSTORM WITH STRONG ROTATION. THIS STORM WAS MOVING EAST AT 60 MPH. (01:00:00) Mike Wilhelm Vinemont Cullman-Laptop:295 mile marker !!!!!!!!!!! (01:04:09) iembot: BMX continues Tornado Warning for Blount [AL] till 1:30 AM CDT ...AT 102 AM CDT...THE NATIONAL WEATHER SERVICE CONTINUED TO INDICATE A TORNADO. THIS TORNADO WAS LOCATED NEAR HAYDEN...OR ABOUT 11 MILES SOUTHWEST OF CLEVELAND...MOVING EAST AT 48 MPH. (01:15:39) iembot: 8 Ese Phil Campbell [Winston Co, AL] amateur radio reports HAIL of marble size (E0.50 INCH) at 12:06 AM CDT -- dime size hail reported 5 miles north of haleyville. (01:15:39) iembot: Anderson [Lauderdale Co, AL] emergency mngr reports FUNNEL CLOUD at 12:12 AM CDT -- funnel cloud reported over anderson community by emergency management officials. (01:15:40) iembot: 1 S Moulton [Lawrence Co, AL] emergency mngr reports TSTM WND DMG at 12:20 AM CDT -- large tree reported down on county road 170, 2 miles off of county road 157. (01:15:40) iembot: 1 W Cullman [Cullman Co, AL] emergency mngr reports TSTM WND DMG at 12:40 AM CDT -- power outages reported west of cullman in the bethel community. (01:15:40) iembot: Somerville [Morgan Co, AL] emergency mngr reports TSTM WND DMG at 12:47 AM CDT -- trees blown down in the somerville community. (01:15:40) iembot: 11 Ssw Cullman [Cullman Co, AL] amateur radio reports HAIL of marble size (E0.50 INCH) at 12:50 AM CDT -- dime size hail reported in the dodge city community. (01:15:40) iembot: 3 W Eva [Morgan Co, AL] amateur radio reports TSTM WND DMG at 12:56 AM CDT -- power outages reported along highway 55...3 miles west of eva. (01:42:02) iembot: 2 Sw Hayden [Blount Co, AL] emergency mngr reports TSTM WND DMG at 01:36 AM CDT -- tree blocking both lanes at mile marker 9 on highway 160. (01:44:47) iembot: Oneonta [Blount Co, AL] fire dept/rescue reports FLOOD at 01:36 AM CDT -- oneonta fire department reports significant street flooding. (02:12:07) Mike Wilhelm Vinemont Cullman-Laptop:they need exrtra assistance at 91 trees are too big for then to handle! (02:13:57) iembot: Priceville [Morgan Co, AL] emergency mngr reports TSTM WND DMG at 12:45 AM CDT -- tree down on a home on north bethel road. (02:13:57) iembot: 2 S Good Hope [Cullman Co, AL] emergency mngr reports TSTM WND DMG at 01:01 AM CDT -- trees down and damaged cars at interstate 65 exit 299. (02:13:57) iembot: 4 N Colony [Cullman Co, AL] amateur radio reports TSTM WND DMG at 01:05 AM CDT -- trees down on interstate 65 at mile marker 295. (02:29:29) abc3340wx-4:what's that near, Mike? (02:34:39) Mike Wilhelm Vinemont Cullman-Laptop:i dont know that either Jason! I know you must be exhausted after a night like that. I am still trying to catch up! I went to a funeral this morning and almost fell asleep.